Is there anything that can be done to help a swimmer who appears to be doing a small flutter kick (not intentionally) after each cycle of the breaststroke kick? She is not a beginner and is aware of the problem yet does not seem to be able to feel herself doing it while racing or even during practise. 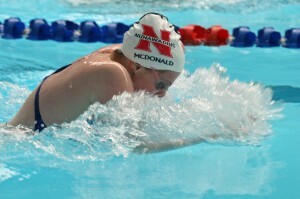 She does own a pair of breaststroke fins . . . does using them help with this problem? Her fly kick is also a problem while her freestyle kick is quite powerful. We are wondering if the fact that she has a very mild case of “pigeon toes” may be a factor. I look forward to any insight you may have on this problem. I think it would be worth videoing the swimmer doing the slight flutter at the end of her breaststroke kick so that she can see what it looks like. Most children are visual learners so when she sees the flutter kick, she will realise that ‘yes, I do need to change this’. 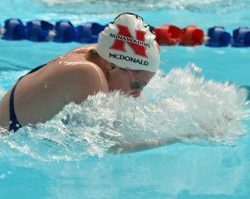 I have not had a lot of experience with breaststroke fins however I would ask her to focus on finishing the breaststroke kick in a streamlined position with the balls of her feet touching and knees touching (if possible). This will ‘straighten’ her out and reduce any flutter kick, especially if the balls of the feet stay together during the glide phase. Using fins for butterfly kick will help her to feel when the feet are together and when they are apart. Butterfly kick on her side, back and front is worth doing, both with and without fins.